The department graduate council has decided to nominate an academic day of the department once in a month. The fourth Thursday of each month is therefore endorsed as an academic day at department level. The first journal club in the department was held in this academic day. Wubalem Fekadu (Assist. Prof, PhD candidate) was the first speaker of the Journal Club on November 9, 2018. He made a critical appraisal on an article published in British Journal of Psychiatry (2018), 21, 34-41. It was titled “Joining Psychiatric care and faith healing in a prayer camp in Ghana: a randomized trial”. He presented the “good” and “poor” lessons of the article to the academic society. Staff and graduate students, later discussed about the article on methodological and ethical issues. 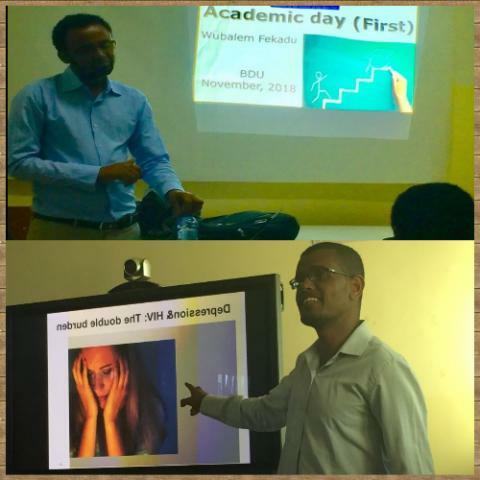 Wubalem, finally wrap up the discussion successfully and he created a motivating environment to the audience. Minale Tareke (Assist. Prof) was the second speaker of the Journal club on December 6, 2018. He presented a seminar on “HIV and Depression”. He stated how depression is the major burden for people living with HIV/AIDS, its effect on the management of HIV/AIDS, and on treatment adherence. Also he displayed their finding of the study in city of Bahir Dar. Journal of Affective Disorders (2018) published the article in volume 232, page numbers 370-374. The participants discussed on the updates, possible interventions and clinical implications. After forwarding different feedback for the coming sessions, the Journal Club was effectively concluded.